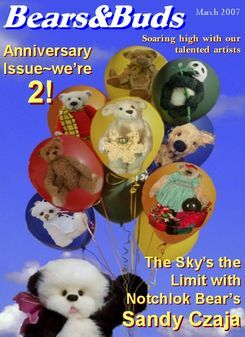 In March of 2007, Bears&Buds introduced its readers to Sandy Czaja of Notchlok Bears. Ten years later, we thought it was time to catch up with Sandy and revisit one of our longest standing members. Long before Notchlok Bears was even a thought, Sandy was already married with three sons who kept her busy with school and sports. When she wasn’t knee-deep in all her sons’ activities, she was working in a dental office. 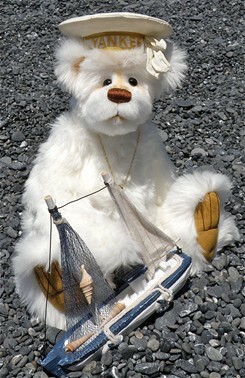 It was during that time when Sandy started her trek into teddy bear making. She made some teddy bears for the women who worked in the office; sewing being a skill of hers she learned from her mother; who taught her. In the early years, Sandy made clothes for herself which eventually lead to her making bears and other small animals for her sons. 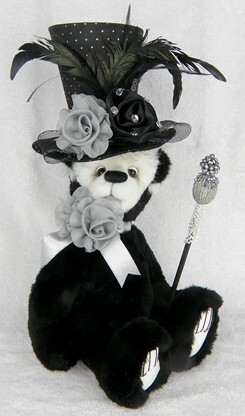 With her talent in bear making, it seems natural that that she could turn it into a business and “Notchlok Bears” was born. Through the years, many have wondered how the name “Notchlok” came to be her business name. Sandy explained, “I had a wonderful grandmother. She was German, but didn’t speak German, except once in awhile one of her words sounded like it came from the German language. If she didn’t like something (perhaps it was made badly), she would say it was “Schlock”. So when I asked my husband, Brian, what he thought would make a good name for my business, he asked me what I wanted my business to SAY. 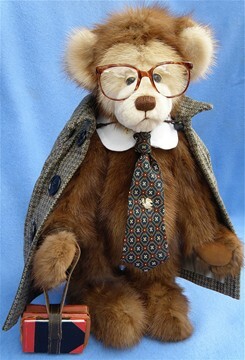 I said I wanted to make the best bears that I could make, not ‘schlock’ bears! He said, “there is your name”. 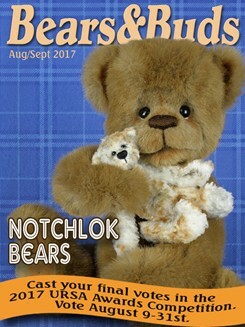 ‘Not-schlock bears.’ I have shortened it a little to Notchlok Bears and I have always been proud of that name. Thanks, Grandma!" 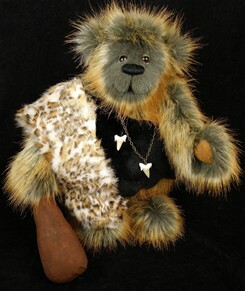 Sandy’s husband suggested that she sell her bears. 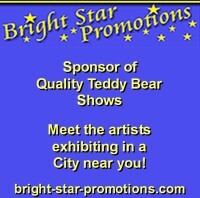 Sandy could not remember if she’d even sold a bear at the show, but she loved it and she was hooked. 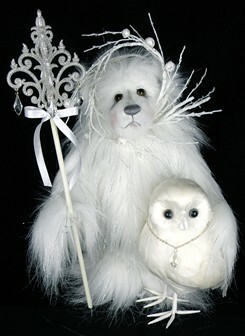 The excitement from the collectors, meeting other teddy bear artists sparked her creative mind. 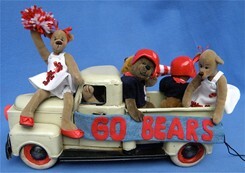 It wasn’t long before Sandy and Brian were driving to shows and selling her bears. “They were also nice little vacations for us,” she remembered, adding that Brian served as her promoter, chauffeur, prop maker and biggest fan through all the years. Originally from Williamsville, NY, Sandy has made her way across the United States, living in Phoenix, Arizona for almost 20 years before moving to the coast of Northern California. 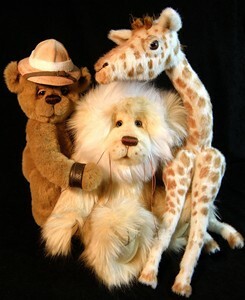 “The one drawback is distance to the teddy bear shows back east, but I love the online shows and I have a website which is under construction at the moment.” Using the Internet, Sandy is in contact with her collectors worldwide. "I love meeting new collectors, even if only through eMails and online sales." she happily participates online and hopes to discover a few teddy bear shows closer to home now. bears and lions, she’s been experimenting with smaller bears too. re-design. I change parts of an existing pattern for a different nose shape, longer legs, bigger feet, or just to accommodate a different length of fur. 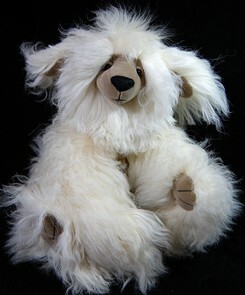 I only create about fifty bears a year.” Her bears range in size from 3" to 24" and are made from mohair, plush and sometimes repurposed fur coats. Thinking she’d like to change the look of her bears at some point, they all have a signature-look and she doesn’t want her collectors to be disappointed. 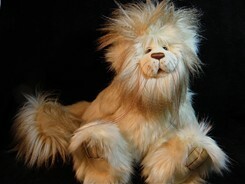 Yet when Sandy has stretched herself to reach a little higher with an idea or design, she’s been rewarded with proud moments of success and acknowledgment from the Teddy Bear community. Over the years winning awards in competitions. 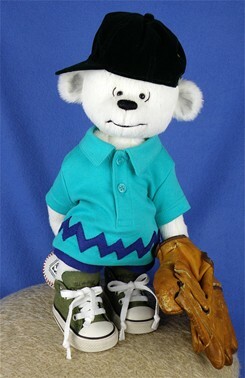 Sandy’s days are spent making her bears and buds. But instead of looking out over the desert, as she did in Arizona, "it is nice to have a cup of coffee on the deck watching for whales at sea." 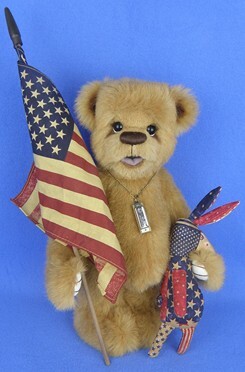 Sandy has been a member of Bears&Buds since 2006. She graced the March 2007 cover and now on the front of the August-September 2017 issue. 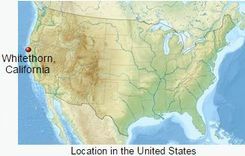 Where is Whitethron, California USA?